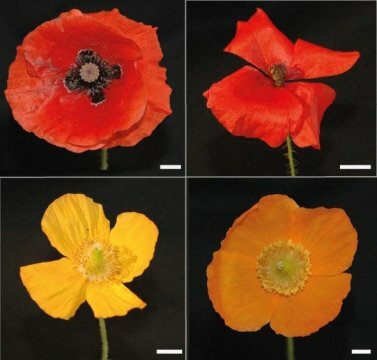 With bright reds and yellows — and even the occasional white — poppies are very bright and colorful. Their petals, however, are also very thin; they are made up of just three layers of cells. University of Groningen scientists Casper van der Kooi and Doekele Stavenga used microscopy and mathematical models describing how light interacts with petals to find out how the vibrant colors are created. The results will be included in a special edition of the Journal of Comparative Physiology A, which focuses on the relationship between insects and flowers. The paper by Van der Kooi and Stavenga will be included in a special edition of the Journal of Comparative Physiology A, edited by Friedrich Barth (University of Vienna). This special edition, with the title “Insects and Flowers. New insights into an old partnership,” is due to appear in print late this spring. The paper has already been published online.